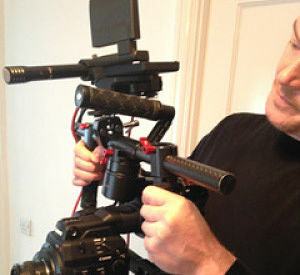 Benedict Coen is an award winning, independent film maker, and tutor in high end video production. When he decided to set up his own business, he turned to Nwes for advice. Chelmsford-based Electric Copper Films launched in January 2017. We spoke to Benedict about his start-up. With the demand for video content at an all-time high, we provide video production services, which offer a narrative structure to otherwise ordinary promotional films. It has been quite a journey to get to this point; I previously worked a variety of jobs to ensure I was eventually able to achieve this goal. I have worked as a mental health practitioner in forensic psychiatry, a fine dining chef, and now a tutor. These jobs served one purpose, which was to pay the rent, with the end goal of setting up my own production company. What have your early days as a business owner been like? Having gathered together the equipment I needed over a period of time, my business partner and I are now beginning to get work of real significance. I work from home, unless studio space is required for a specific project. Electric Copper Films is gathering pace, and I am determined to make it a success – I’ve exhausted all my ‘plan B’s’! I am relishing taking all of my experience and know-how and providing quality films for my clients, which range from musicians and artists, to corporate tutorials and documentaries. There are opportunities on the horizon to fulfil a childhood dream to direct a quality feature film. “There are challenges in many productions, but these bring learning opportunities. Whether it’s the cramped studio of a police interview suite, or in the middle of a forest in the pouring rain, comfort is something you learn to be without when shooting films. Tell us about the challenges and highlights? There are challenges in many productions, but these bring learning opportunities. When you’d rather be doing nothing else, obstacles are rarely insurmountable. The highlight of finally realising my business dream has been the artistic freedom I wanted, and the people I have met along the way. I built a good relationship with Business Advisor, Gillian Austin. Through the Start & Grow programme, Gillian supported me through the start-up process, and will continue to support Electric Copper Films as the business develops. Through Nwes we have been given some very useful contacts that have led to productions that we are currently working on. It was also an excellent service for focusing the business plan and providing objectivity and rationale to our first business ventures.